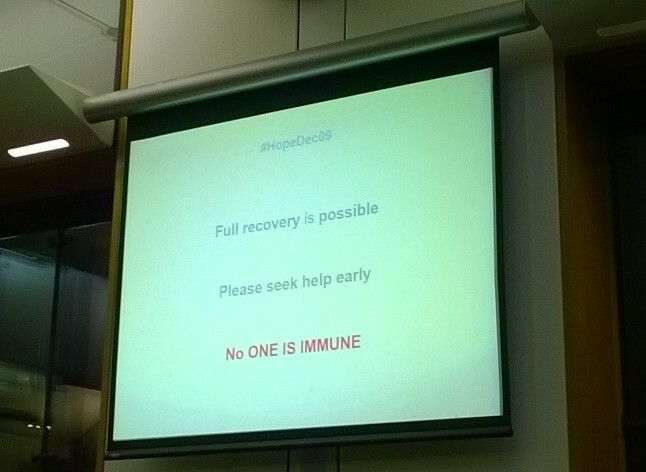 It was amazing to be at the House of Commons last week for the #HopeDec09 event, organised by obstetrician, Raja Gangopadhay, and attended by around 150 others with an interest, passion or professional role in perinatal mental health. APP’s Chair, Giles Berrisford, opened proceedings in his role of Associate National Clinical Director PMH, reporting that things do seem to be changing and there is more awareness and profile than ever before, but of course, there is so much more to do. It is always inspiring to hear Alain Gregoire of the MMHA speak and his words about maternal mental health and its far-reaching consequences being “the most important issue for humanity today” was really great to hear. 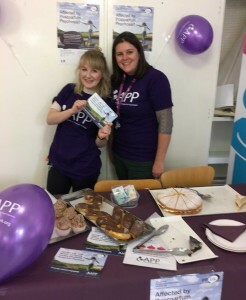 I wish there had been more time to talk about APP and the amazing peer support it offers, together with our pilot Regional Reps work to spread awareness of the organisation and that PP can affect anyone, as it did me. This slide said a lot for me: "Full Recovery is Possible. Please seek help early. No-one is immune." The event focused on the importance of addressing mental health conditions during pregnancy and beyond and we heard from a diverse range of those with “lived experience” – it is so important to share these stories. PP and schizophrenia were powerfully presented by artist, Sanchita Islam and PND movingly by Lindsay Robinson of haveyouseenthatgirl.com and Mark Williams of Fathers Reaching Out Wales. Antoinette Sandbach MP also had a number of people in tears as she spoke emotively about her experience of bereavement and the effect that this can have on women and families. The heads that nodded along (including my own), as if to say “me too” at various times during all of the speeches was really amazing to see. It was fantastic that the whole of the UK and beyond was represented in the room, with people standing up to talk about changes in Scotland and the ongoing campaign for a Mother & Baby Unit in Wales. Lindsay had also spoken of changes she is working towards in Northern Ireland. 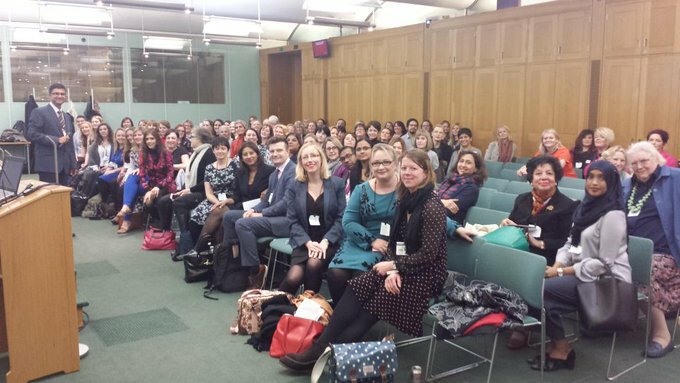 As a proud Yorkshire lass, I enjoyed meeting up with others from the north – it is sometimes easy for us to be forgotten in the blur of all things perinatal and activity that naturally often centres on London and the other big cities. I had great conversations with another peer support organisation Raindrops to Rainbows, who are based in the north-east and supporting women and families affected by PND, so there may be ways for us to link in in the future. Our chats continued on the train north at the end of a long, exciting and inspirational day. Words from representatives of the Royal Colleges of GPs and Midwives together with a former Royal Obstetrician and a response from the Duchess of Cornwall which was read to the room showed that the event had a really high profile. Together with those from the media and a range of organisations I hope that this really gave the event some clout to effect real change. 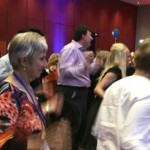 I hear that it trended on Twitter throughout the day – surely the mark of success! 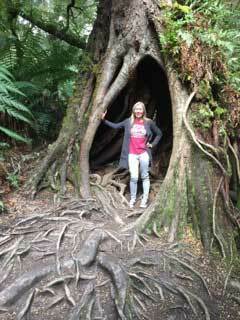 Hannah Bissett is APP's Assistant Peer Support Coordinator. Congratulations to APP Peer Support Coordinator, Ellie Ware, who has been appointed to the Executive Group of the Sussex Perinatal Mental Health Clinical Network. Sussex is one of 20 areas across the country which will benefit from funding to improve care for pregnant women and new mums experiencing, or at risk of experiencing, mental health difficulties. "It's really exciting and a real privilege to be asked to be part of the Executive Group that will be developing the Sussex perinatal mental health service, which is my local service. I hope to bring not only my own personal experience of PP -- what was good about my care and what could have been better -- but all the stories and voices of the women and families APP support." Sussex Partnership currently offers a Specialist Community Perinatal Service in Brighton & Hove and in East Sussex. The new funding will allow the team to expand and to provide specialist support to women, their families and their babies across the whole county – for the first time in West Sussex – and at East Surrey Hospital. 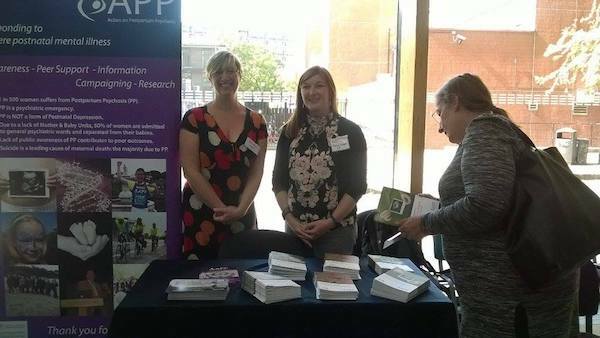 Photo shows Peer Support Coordinators Ellie Ware (left) and Hannah Bissett (right) representing APP at London South Bank University Perinatal Mental Health for Healthcare Professionals conference in September 2017. Fantastic recognition for the good work APP does! 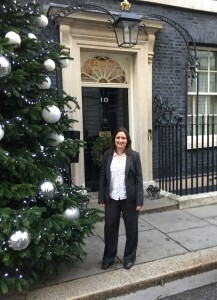 APP Director, Dr Jess Heron, was invited to 10 Downing Street to attend a reception of small charities across the UK that make a big difference to people's lives. The government recognises that the economic climate is hard for small charities and has pledged to find ways to help small charities doing good work become sustainable. Dr Heron said "It's fantastic for our work and the amazing dedication of our volunteers to be recognised in this way. We know that we save lives and that we have caused a sea-change in public interest and understanding of PP, but it's great when it's recognised by others"
"Working on a Mother and Baby unit, we are all very aware of the illness postpartum psychosis, as well as many other illnesses relating to women during pregnancy and after giving birth. We want to raise money for the amazing charity APP and support their work as well as raise awareness around mental health during pregnancy and after having a baby." 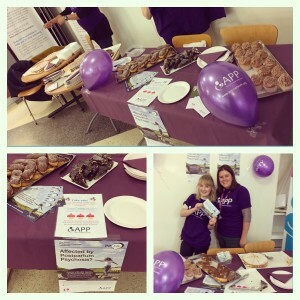 "Just wanted to share some photos with you from our cake sale. The fundraising is going well, so far we have raised nearly £500! We are planning to do a raffle for Christmas and of course sharing our JustGiving page for people to sponsor us for the half marathon." You can support this wonderful team of people at their JustGiving fundraising page here. 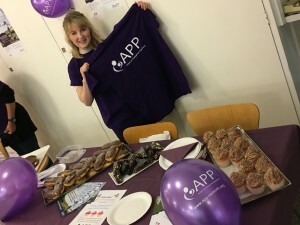 On 30th Nov Dr Jess Heron, Director of APP was asked to speak on Radio Wiltshire's Breakfast programme. She was asked to respond to the news that Wiltshire mum, Holly York, said that the NHS let her down after she gave birth and was suffering from extreme Postpartum Psychosis. 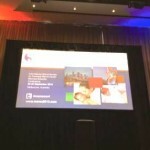 Jess took the opportunity to explain more about Postpartum Psychosis and to comment on its current status within the field of perinatal mental health. In addition she made an appeal for continued support of APP charity as a consequence upon the ending of major funding by The Big Lottery. The Marce Society was founded in 1980 by Professor Ian Brockington (also founder of APP’s research network). 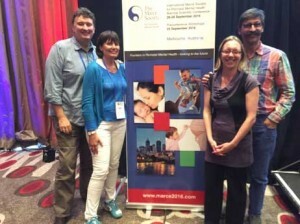 The Society promotes research into the mental health of women, their infants, and partners around the time of childbirth, and the Marce Society’s biennial conference plays host to the most cutting edge international research in Perinatal Mental Health. Dr Sue Smith, Consultant Perinatal Psychiatrist, Cardiff, first attended the Conference in 1996. She reports for APP on the differences she has noticed between then and now. On returning from the Marcé biennial meeting in Melbourne in September I was keen to consolidate the copious notes I had made and summarise what I had learnt. Digging around in my office I found that I had done a similar exercise after attending my first Marcé meeting in London in 1996. I was struck by the similarities between what was presented and discussed then and what was still on the agenda 20 years later. However what has changed is the number of people who are talking about perinatal mental health, the increased multidisciplinary aspect of the membership of the Marcé, the input from women with lived experience and the ‘women power’ represented by the number of recent female presidents! It is probably fair to say that in 1996 perinatal mental health services were regarded as something of a luxury. Twenty years on despite still trying to understand the biological underpinnings of peripartum mood disorder (and I left scratching my head after some of these talks!) the absence of a service is now more of a talking point than the presence of one. In the UK the tireless work of the Maternal Mental Health Alliance has highlighted the areas where services are lacking - and the hope is that its launch globally, announced at the conference by Alain Gregoire, will achieve similar things on a worldwide scale. Accepting that for many countries services are limited and that those attending Marcé are likely to be people from places where services are developing or have developed, it is still impressive that I heard many inspirational talks from various parts of the world including Australia, New Zealand, Canada, USA, Portugal, Scandinavia, France, Malaysia, Bangalore and of course the UK. 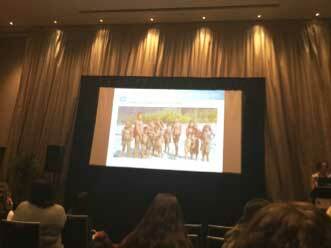 A major theme throughout the conference was the importance of pregnancy and within this a particularly fascinating talk was given by Rachel Yehuda from the USA. Her work on holocaust survivors may have demonstrated that psychological difficulties in their offspring could be related to preconception effects of trauma, passed on at conception and further developed during pregnancy. The concept "It takes a village to raise a child" was a lovely way of introducing a number of talks about how in western societies the role of the family and wider social networks in supporting women in the postnatal period has largely been lost. The challenge is how to replicate this sensitively within the networks of professionals women now encounter in the perinatal period. There were a number of presentations about fathers and the importance of acknowledging their part in it all. It was interesting to hear about a service where dads were texted daily to ask how they were. It also reminded them to complement their wives/ partners who appreciated this even though they knew they had needed prompting to do it! It was great to see Mark Williams from Wales talk passionately about his experience when his wife suffered severe postnatal depression - though I think his "by 'ere" may have confused some people! On the theme of decision making about and within pregnancy, it was great to hear Claire Dolman talking about the dilemmas of pregnancy in bipolar disorder and the recent BJPsych open article she did with Ian Jones and Louise Howard. Simone Vigod from Toronto talked about a decision aid they are developing regards taking antidepressants during pregnancy. Initial results did not demonstrate a great reduction in decisional conflict but with some refinement this could be a very useful tool. 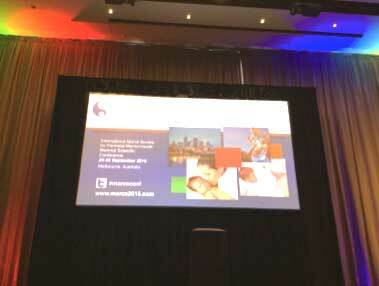 It is very unusual to see a drug company representative at a perinatal meeting but Sage Therapeutics from the USA bucked this trend by presenting their very early but potentially exciting research using allopregnanolone, a metabolite of progesterone, for postnatal depression. It is early days but initial results were promising so watch this space! 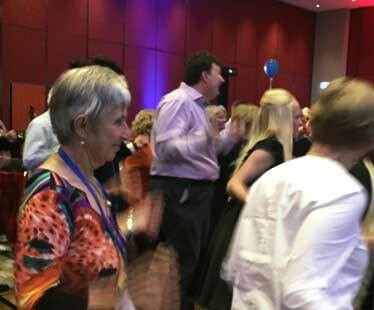 It wasn’t all hard work - the Gala Dinner was followed by us being taught how to do Bollywood dancing in advance of the next meeting in Bangalore - some of you may recognise who is getting into the swing of it all! - a lot of people care about this field including those with the power to do something about it i.e those with the purse strings - so we have to keep nagging! New Research Study on Partner Experiences. Men’s experiences of having a partner who requires Mother and Baby Unit admission for first episode postpartum psychosis. Perinatal mental health services and organisations such as APP are becoming increasingly aware of the need to support and involve partners of women who have experienced postpartum psychosis (PP). However, there has previously been little academic research into the needs of partners during this time. A recent study has focused on the experiences of seven men whilst their partner and baby were admitted to a Mother and Baby Unit (MBU) for treatment of PP. The author of the paper has written a piece for APP to tell us more about the findings of the study and how this could affect how services work with partners in future. Research has told us that PP can have a life changing impact on women’s experiences of motherhood, relationships and sense of self. 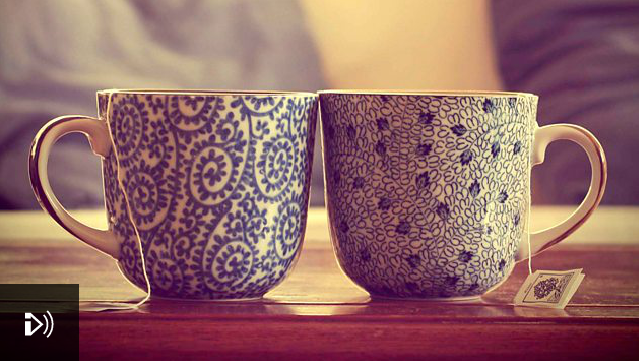 Their partners also often need to adjust to understanding the condition and support recovery. Perhaps understandably, the vast majority of perinatal health research and clinical practice has previously been focussed on the wellbeing of the mother and baby. Whilst dads are being increasingly recognised it is often in their capacity as a partner who is supporting the mother, rather than as a person in their own right. In the research, it remains unclear how dads are affected by the severe and sudden nature of PP and by the separation from their partner and baby during their admission to an MBU. This study aimed to explore dads’ experiences of early fatherhood and relationships during their partner’s admission for their first episode of PP, to help improve our understanding of their needs and how services can work with families during this difficult time. Seven fathers were recruited from two UK MBUs. For all participants, this was their first child with their partner. All of the men’s partners were inpatients on an MBU at the time of being recruited but were nearing discharge after having some periods of home leave. The men took part in interviews, which were analysed using an approach which focuses on making sense of how people understand their individual experiences. The participants’ stories reflected the natural uncertainty surrounding the birth of a child, which was amplified by the unexpected onset of a severe mental health problem. There were two main themes within these fathers’ stories which are detailed below and illustrated with quotes from the interviews. All names used are pseudonyms to protect the participants’ anonymity. Main theme 1: What the f**k is going on? This theme reflects the lack of understanding surrounding PP and its treatment. Frustration and anger were common, perhaps due to feeling helpless, loss of control and fearful. Most men found it difficult to recognise the early stages of PP, as they were not sure what is normal for a new mother. For most, this was their first child and their first direct experience of a mental health difficulty. As symptoms progressed to the more acute stages, men expressed a range of emotions such as shock, confusion and embarrassment. Experiences of seeking professional help were varied. Health professionals (e.g. GP’s or A&E staff) didn’t always know about PP which sometimes led to a delay in treatment and frustration for partners. Most of the participants didn’t know what PP was when the diagnosis was first given, although having a name for their partner’s difficulties often seemed to give some sense of understanding and hope. Some found the internet useful for finding more information, including personal stories from other families on the APP website. Following diagnosis, all participants wanted to be involved in their partner’s care; however not feeling heard or valued by professionals was common. Many felt their concerns were dismissed and not taken seriously. There was lots of frustration with confidentiality procedures and the priority seemed to be on mother and baby, not dads. Some were comfortable in challenging this and asking for information, others were less so. When done well, information sharing and involvement helped dads’ understanding of what was happening for their partner. This theme captures the impact of PP on the roles, relationships and identity within the family. Most participants felt more responsibility to care for both their partner and baby as PP symptoms progressed. Many dads felt pushed to their coping limits and appreciated help from family and friends. Some women were first admitted to general inpatient units which were not felt to be very helpful or appropriate. MBU admission was usually a relief and gave permission for dads to look after themselves. Many trusted the MBU staffs’ expertise and saw it as an opportunity for learning and growth. However, handing over caring responsibility was difficult for some. Most dads felt a huge loss for their relationship and partner during this time. Many felt alone; the shared experience of starting a family with their partner had taken very separate paths. Some went through a grieving process as their partner’s identity seemed to have been changed by PP. For others PP was seen as something external ‘taking over’ their partner. Men tended to feel less loss around the separation from their child; this relationship was often seen as more stable and positive. Many had started to reconnect with their partner as they started to recover, but the long-term impact was unclear. Most did not want more children because of future risk of PP. PP delayed adjustment to being a family, which was often made worse by large distances between home and the MBU. There were lost opportunities to do ‘normal’ activities with the baby and some expectations of parenthood were not met. For some it was hard to parent the way they wanted to on the MBU but others had more positive experiences. Some were worried about how family life would be when returning home, whilst others saw their family as ‘back to normal’ already. Improved awareness of PP is needed, for both health professionals and the public, to allow faster diagnosis, access to the right treatment and less stigma around the condition. Improved access to MBUs is needed. In this study, general mental health services were not viewed as appropriate by dads (previous research has found women feel the same). Many men had to travel large distances to visit their family due to the lack of availability of local units, which created increased stress, separation and financial pressures. Health services need to improve how they work together with fathers. Many felt excluded from their partner and baby’s care, causing more frustration and confusion. The timing and type of support services offer to fathers should be considered; even if men say ‘no’ once they might need help in future. Many of the participants reported not feeling ready to talk about what was happening until the time was right for them. Sometimes services do get it right! Most men had positive experiences of MBUs and saw them as a valuable resource which helped their partner’s recovery and their own ability to support their family. The sample of participants was limited; more research is needed with partners with different backgrounds and family structures (e.g. different cultures, families with multiple children). The researchers would like to thank all of the men who took part in the study and their partners for consenting to this at a challenging and emotional time for their families. Thanks also go to the staff teams at the MBUs who helped in recruiting for the study. BBC One documentary, My Baby, Psychosis and Me, which aired in February this year. BBC Radio 4's The Listening Project on Postpartum Psychosis. BBC One Eastenders, Stacey Branning postpartum psychosis storyline that APP collaborated on with Mind and Bipolar UK. 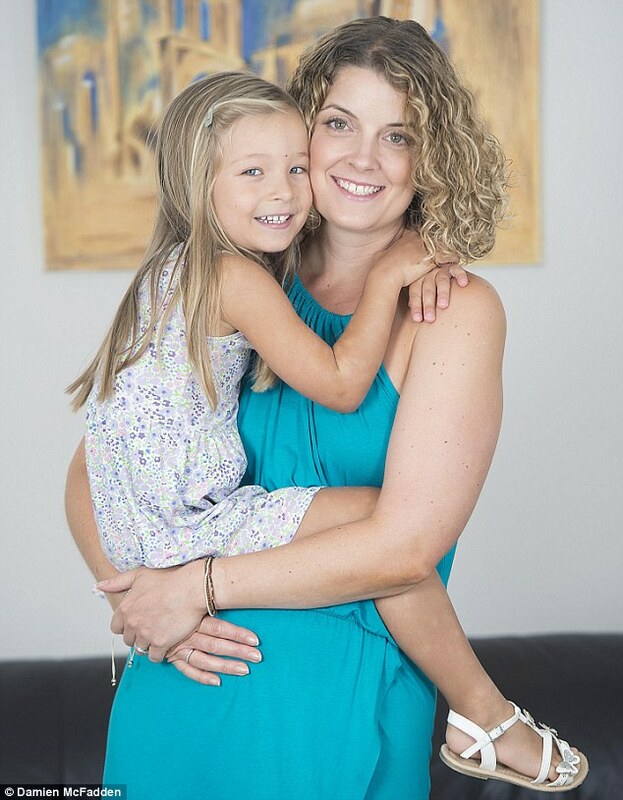 The Sun Fabulous Magazine article, "Having a baby made me psychotic" featuring APP media volunteer, Kathryn. Mind's CEO, Paul Farmer said, "The media we consume, whether through TV documentaries, print news, digital blogs, radio or film, has a huge impact on people’s attitudes towards mental health problems." We believe that all four of these sensitively told PP stories go some way to raise awareness of the symptoms, help reduce the stigma surrounding this mental illness and help those who develop Postpartum Psychosis get diagnosed and treated more quickly. The winners will be announced on 14th November. 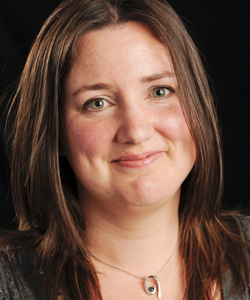 Congratulations to APP trustee Clare Dolman who has been invited to take part in the development of a national ten-year strategy for mental health research. The recently published Five Year Forward View for Mental Health recommended that the Department of Health, working with others, should set out a ten-year strategy for mental health research. The work has been divided into different areas to cover Basic Research, Translational Research, Population and Health Services Research and Children and Young People. “I’m very pleased to have been asked to take part in this important exercise, especially as it enables me to represent people using mental health services, particularly perinatal services”. Overseen by Professor Chris Whitty, the government’s Chief Scientific Adviser, these groups will meet over the next few months with a view to publishing recommendations next year. 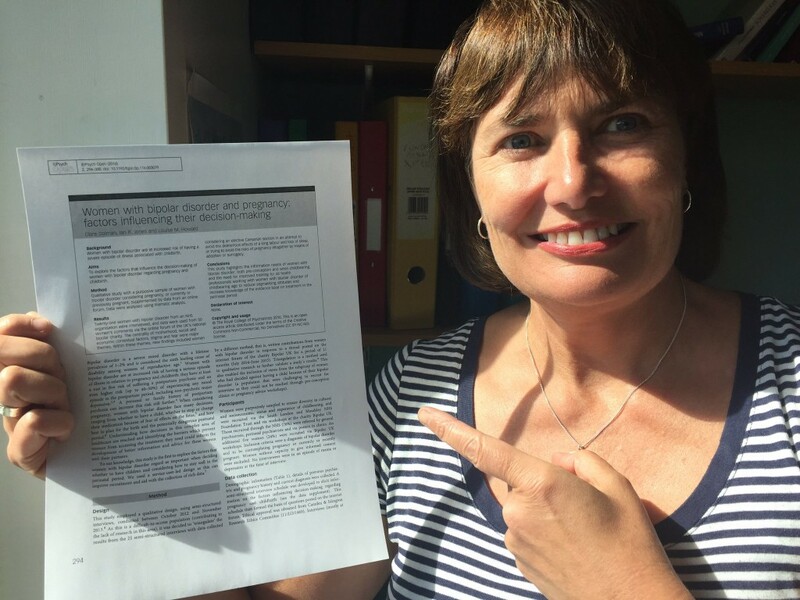 This week also saw the launch of a paper written by Clare on on decision making in pregnancy for women with bipolar (see photo) which you can find here. Double congratulations!